Home » Foto Friday, Funny, Travel » Funny Foto Friday: Sniffing Strictly Prohibited! Funny Foto Friday: Sniffing Strictly Prohibited! In March 2006 we visited the beautiful Junagarh fort in Bikaner on our trip through Rajasthan. Somewhere in the large complex, which was built by Raja Rai Singh in 1588, we found a lone basil plant sitting on a small table in the middle of a large empty room. In India, holy basil, which is called Tulsi, has been known for thousands of years for its healing and medicinal values. 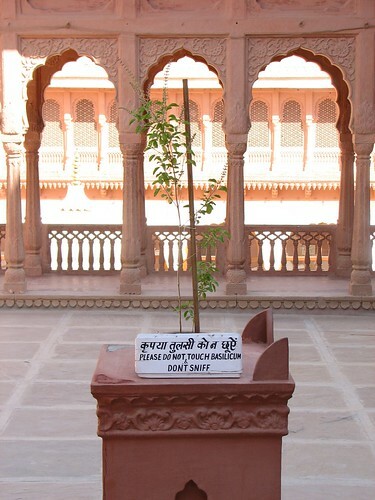 It is therefore an important symbol in the Hindu religious tradition, and obviously they don’t want passing tourists to touch or sniff this holy plant. 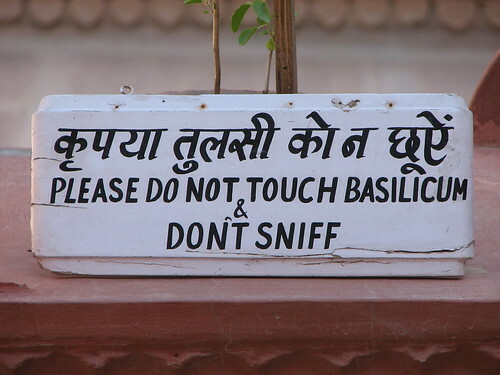 Still, I thought that the sign with the plant was rather funny: “Please do not touch basilicum & don’t sniff”. First time I saw a sign telling me not to sniff something. This entry was posted on Friday, January 9th, 2009 at 1:23 am CET and is filed under Foto Friday, Funny, Travel	with tags . You can follow any responses to this entry through the RSS 2.0 feed. You can leave a response, or trackback from your own site.